Don’t play coy with me. I’m willing to bet a bushel of beets that you’ve succumbed to that toe-tappin’, arm-flappin’, booty-shakin’ boogie that can sweep even the most demure damsels into a frenzy. I’m talking about the happy dance. Yes, the happy dance. No special steps, no partner required. It’s just a spontaneous physical expression of joy. Gratitude in the raw. If you haven’t done it, you really ought to try it. Dancing takes happy and makes it happier. Farmgirls on my chatroom cluck about doing the happy dance when they receive random art in the mail from their mail art efforts. Making other people happy while you’re doing it. Doing the happy dance in private is one thing. Displaying it is another. But don’t tell that to Erica McElrath. The self-proclaimed “Happy Lady” of St. Louis, Missouri, makes her mark on a daily basis, singing and dancing on city street corners. Back in January of 2010, Erica lost her full-time job as a nursing assistant, but instead of mourning an empty glass, she got busy filling it up, sharing her gratitude by dancing. With no schedule to maintain, Erica took to the streets. Dancing, that is. She wanted to spread the message that no matter how difficult our circumstances, we should all do something that makes us happy. By devoting herself to happiness (her own and that of passersby), Erica has opened doors for herself. She is working again, and she has created a Facebook page where friends and fans can bask in her daily doses of optimism: That lady who dances on the southwest corner of grand and Choteau. You can soak up a bit of Erica’s happy dance by watching this video, filmed by St. Louis photographer Mark Katzman: Happy Lady. 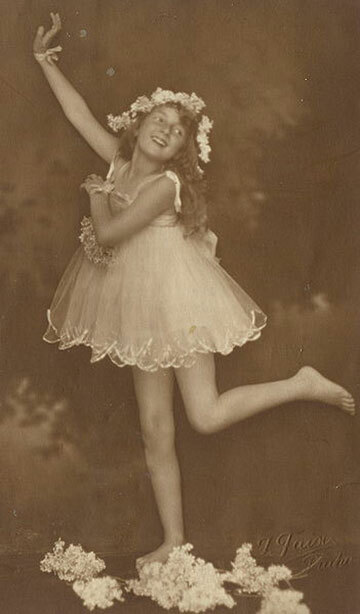 Little Dancing Girl, circa 1900. Photo courtesy of Wikimedia, J. Taix. Oh My Yes. The last time I did a rousing version of the happy dance was when my palomino filly was born. I’d waited about 10 years for such an event…and bred 3 different mares. When it finally happened at 2 AM one July morning, I was stunned. I wept because I had all but surrendered the long held hope. Instead, I had shamed myself into being joyful at the prospect of a healthy baby. It was then that I was gifted with a healthy palomino babygirl. The only thing that would have made my happy dance more festive is if I’d had a sombrero to dance around. Thanks for the reminder :o) She is now all grown up and under my saddle … the real dream come true. Happy Dance!!! I have done it all my life. I am always dancing around in the kitchen when I am cooking. I think that is why my cooking is so irresistable!!! My kids used to get a little embarrassed by my dancing in the kitchen but I would just grab them and swing them around once and make them laugh! I would hear them telling their friends to not be embarrassed if I swung them around I was just a little over exuberant in the kitchen. Be so happy that sour faces light up with crazy laughter! Life is good!